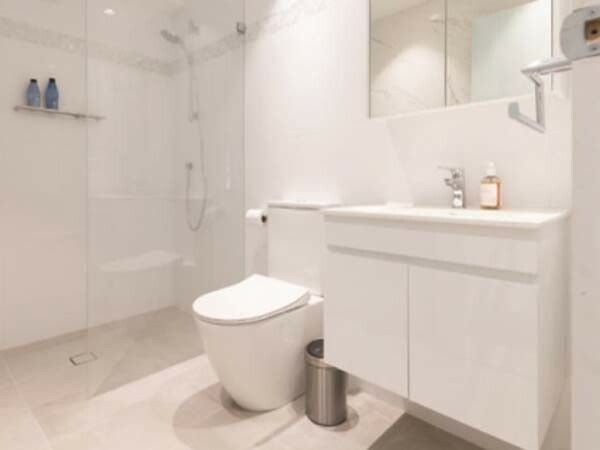 A basement space was transformed into a multipurpose room using a macerator pump from Saniflo to facilitate efficient plumbing in the underground area. Carla and John Giannakopoulos had initially considered selling their beautiful South Coogee home, but instead decided to create an additional living area that could double up as a guest space, a teenage rumpus room or a granny ﬂat. Though they found the perfect location for the planned room, the challenging part was making it a reality. The space available was behind the garage, underground and under the sewerage mains. This presented some structural as well as plumbing challenges. Traditional plumbing was immediately ruled out, given the situation. Carla found the perfect plumbing solution for her particular application in Saniﬂo’s Sanicubic 2 Pro WP, a sewerage macerator pump that allows installation of wet areas in underground spaces. The heavy-duty pump pushes waste water up to 11m vertically or 110m horizontally to the sewerage and stormwater mains, allowing the installation of a toilet, sink, shower, bathtub, washing machine, kitchen sink, dishwasher, tankless water heater and bidet in areas without plumbing access. With two motors and a wireless alarm, the Sanicubic 2 Pro WP offers a powerful and reliable solution. To achieve Carla and John’s desired guest space, a Sanicubic 2 Pro was installed inside the closet, under the ﬂooring. This pump enabled the installation of a toilet, shower, dishwasher, washing machine and two sinks. In addition to a complete bathroom, the couple was also able to install a kitchenette and a washing machine, enabling their guests to be self-sufficient. Thanks to Saniﬂo, Carla and John have achieved their dream additional living area, creating a beautiful studio apartment out of dirt, while also increasing the value of their home.